What was Your Favorite Anniversary Gift? What Diamond Shape Are You? Home » deBebians Fine Jewelry Blog » What was Your Favorite Anniversary Gift? Celebrating another year together as a married couple is a special time. What are some things that have made celebrating your wedding anniversaries memorable? Do you celebrate the same way every year, or do you do something unexpected and different? What are your favorite styles of diamond anniversary rings for women? Do you have a favorite anniversary gift? 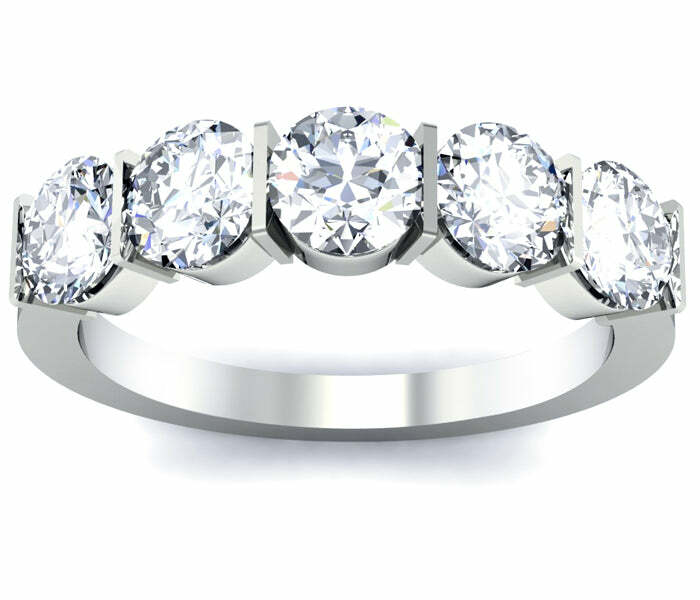 At deBebians, our most popular diamond anniversary rings for women are our five stone wedding band styles. We have a five stone wedding band for every woman. These rings are appropriate for any year wedding anniversary, not just for five year anniversaries. Although, it is easy to see why this would be an appropriate gift for that particular wedding anniversary. A five stone wedding band is an appropriate choice for a wedding anniversary gift, especially if you are celebrated your 5 year wedding anniversary. How do you and your partner typically celebrate your wedding anniversary? Do you exchange gifts? What is your favorite gift that you ever received? Let us know in the comments. Own a jewelry store? We can help. deBebians was founded by two GIA Graduate Gemologists to provide quality jewelry and excellent customer service all for a great value. We ship all of our products fully insured and with a 30-day money back guarantee. Join our mailing list for exclusive offers. Don't worry, we won't email you constantly.